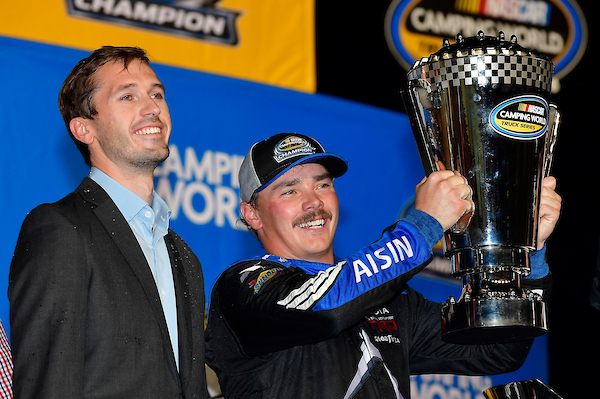 GMS Racing announced today that 2018 NASCAR Gander Outdoors Truck Series (NGOTS) champion driver Brett Moffitt will join the organization for the 2019 season. The 26-year-old Grimes, Iowa native will be defending his championship title in GMS’ No. 24 Chevrolet, alongside veteran crew chief Jerry Baxter. Moffitt won the 2018 NGOTS championship with his sixth victory of the season at Homestead-Miami (Fla.) Speedway. In his first full season competing in the NGOTS, he earned six wins, 13 top-five finishes and led 269 laps. In 2017, Moffitt competed in seven Monster Energy NASCAR Cup Series races, one Xfinity event and five Truck Series races. He has seven career wins in the Truck Series and was the 2015 Monster Energy Cup Series Sunoco Rookie of the Year. “Brett will be an excellent addition to the GMS organization,” said Mike Beam, team president. “Last year he showed the racing world the amount of talent and determination he has, especially while facing some adversity throughout the season. We look forward to helping him win his second championship and ours as well.